My last update was February, 2016. Quite a lot has happened since then! In early March Leigh and I got the boat out of US waters, to the Bahamas. 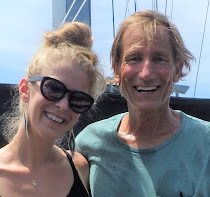 We did well for novice sailors, covering about 900 miles in 3 1/2 months in a loop from near Miami to Bimini, Andros, New Providence, the Exumas, Cat Island, Eleuthera, the Abacos and back to FL. We experienced everything you'd imagine: so much raw beauty, new friends, crystalline warm water, all kinds of weather, repairs, fish, frustrations, successes, failures and humblings. I can't even begin to sum it up. Videos 041 to 052 at https://www.youtube.com/user/presencingly give some sense of it. I also posted a YouTube series on Madagascar if that interests you. We motor sailed the IntraCoastal Waterway north from FL. The diesel engine, troublesome since the Abacos and despite my and many others' diagnosis and repair attempts, finally failed a few miles from our home port. I'll replace it with an outboard. We were towed the last 8 miles. I felt exhausted and defeated. So there we were: At a slip in Brunswick, GA, mid June on a disabled boat, free beer and wine, punishing sun, heat and humidity fast approaching, and a long list of repairs. The only sane option for me was to get off the boat to someplace terrestrial and cool. I looked to the southern hemisphere (mid winter there!) and settled on New Zealand: a bucket list first world country, a favorable exchange rate, English speaking, and plenty to explore. I rented a campervan and slowly wandered the country for the next four months seeing, well, almost everything on both the North and South Islands. I love rain, weather, geology, oceans, creatures, history and green. A mobile man-cave was very healing for me. Leigh was called differently. She spent two months preparing with cleansing diets, art, exercise and yogas, culminating with 2 weeks of plant medicine work in Pisac, Peru. Then back to the states for a week before joining me on South Island, New Zealand. We're finally back in the US. I checked on the boat in GA and it survived hurricane Matthew. If the 10' storm surge had hit only a few hours earlier or later, she'd be lost. The repairs await my attention.Leigh found a place for us through connections in the sailing community. It is in the high desert SE of Tucson. Towering 8,000' mountains and cliffs out the back door. Cool, clear and dry. Some good paragliding sites are nearby. Oh, to get back in the air! We may do some backpacking. I'm now catching up on long overdue business, family visits and reconnecting with you. The plan was to work on the boat this winter and sail north to Maine in the spring and summer. There are a few moments that have profoundly shifted me: being burned, Kennedy's assasination, the first moon landing, finding the mangled body of a woman killed by a hit and run driver, 9/11, my first trip to India, working at Folsom prison, my 7th trip to India, and this election. This note barely skims a lot of ground. But now I'd love to hear from YOU about anything and everything! Sailing, living aboard, personal work, New Zealand, the high desert, boat projects, the election, paragliding, business, new adventures, all of it!